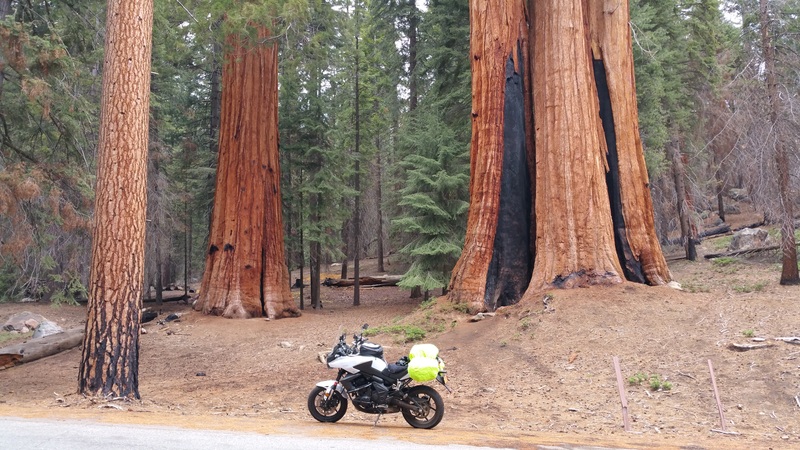 Since I had such a good time riding through the Sequoia National Forest yesterday, I thought I’d go ahead and spend another day exploring the area. So, I got started at around 8:00 am and headed towards Glennville on 155. I was looking for a specific Forest Service road (23S16) that is shown on the map that I have. I rode around in circles for about an hour before finally giving up and changing my route plans. I headed north through the forest on another Forest Service road (23S05). Within a couple of miles, the sky started to get a bit grey and I started feeling a few sprinkles of rain start falling so I stopped and put rain covers on the soft bags and kept on going. Near the end of this road, a guy unloading a horse from a trailer stopped me to ask about the weather. I told him that I had run into a few sprinkles and heard some thunder. I asked him if the horse was afraid of thunder and he replied “I don’t know, but I’m about to find out”. He also told me that there was a nice place to visit called the Trail of 100 Giants just a few miles north of where we were. I decided to go ahead and ride to the Trail of 100 Giants. After parking, I got a trail guide and went for a short walk to admire the giant trees. Even though I’ve seen these trees before, they’re always impressive. I spent about 40 minutes admiring the tree before getting back on the bike to continue the day’s ride. By this time, it looked like the rain storms were becoming more widespread with hardly any blue sky visible. As I headed east toward Johnsonville, it looked like I was heading toward some heavier rain so when I saw a road that went south where the sky looked a bit better, I went that way instead. As it turned out, the road that I found was the 23S16 road I was looking for earlier in the day. This road went through some forest that had been burned so the views weren’t as good as some of the pristine forest I’ve seen but it was still an enjoyable ride. During the 25 or so miles I rode on this paved mountain trail, I ran through some light rain but avoided the heavy rain that appeared to be just a couple of miles away. As I emerged from the forest, I decided it was time to head back toward Bakersfield to find a room for the night. As I descended out of the mountains, the air temperature rose dramatically. 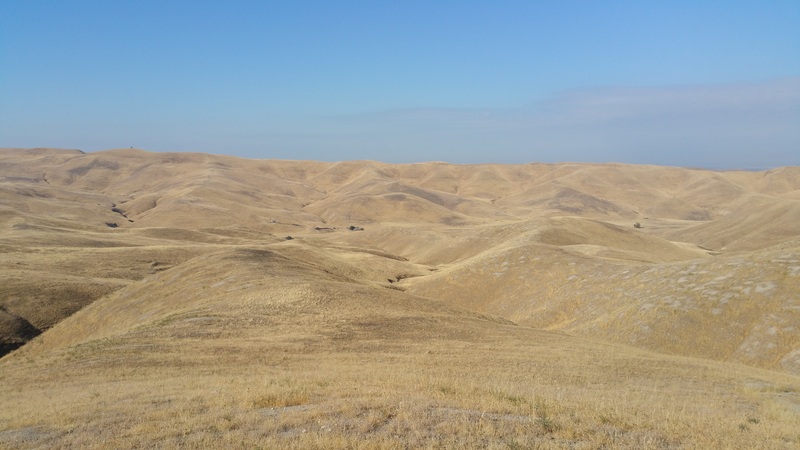 By the time I got to Bakersfield, it was almost 100 degrees and I was glad to stop, get my leather jacket off, and get into a nice air-conditioned room. For as long as I’ve been riding, it seems like I always feel the need to keep on moving and see as much as possible every day. Today, I decided that I was going to slow down, relax, and take my time. I actually stopped quite a few times to take pictures and just enjoy the scenery. I only traveled about 150 miles and went the whole day on a single tank of gas. I sta rted out around 8:00 this morning and headed out into the Sequoia National Forest by way of Breckenridge Road. The first part of the ride went through large areas of grass with cows grazing out in the open range. It was a surprisingly warm beginning to the day – not hot but comfortably warm. After climbing higher up into the mountains, the landscape transitioned from grasslands to forest. The temperature dropped slightly and became what I would have to describe as perfect weather. The road was narrow with and I had to watch for patches of sand that had fallen from the sides of the hill. The scenery was spectacular and there were no other cars on the road – none, not even one. There was plenty of wildlife along the road. There were squirrels everywhere. I must have seen at least 100 squirrels run across the road over the course of the day. Surprisingly, I only remember seeing 1 dead squirrel so they seem to have mastered the art of crossing roads without getting run over. I’ve never seen so many squirrels in a single day. There was a spot near a ranch entrance where I probably saw 20 or more of the furry little rodents scurry across the road in a 100 ft stretch of road. I couldn’t believe my eyes as one after another sprinted across the road. It was comical. I rode by a rattlesnake in the road and after determining that it was dead, I turned around and took a picture of it. It was a small one, maybe 30 inches long. It’s the first time I’ve seen a snake out here in California. 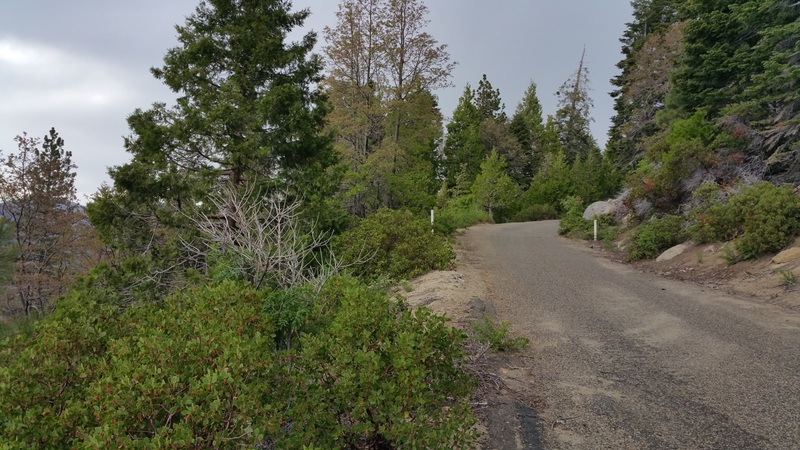 I turned off of the paved road onto a Forest Service road (28S62) and continued climbing up the mountain and through the forest. The road was in good condition making for a nice easy ride. 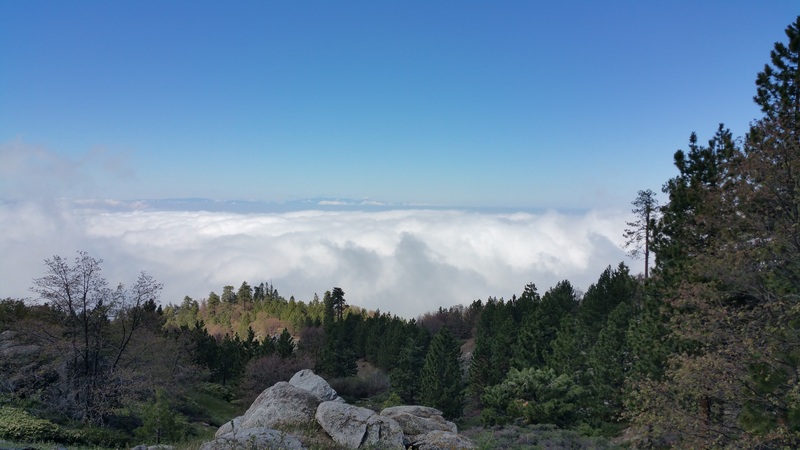 As I continued through the forest gaining altitude, I rose above the clouds that covered the surrounding mountain tops. The views were incredible. The Forest Service road brought me up to Breckenridge Lookout which I though was just going to be a nice place with a scenic overlook or something like that. I parked the bike and headed up a trail and found that there was a fire tower where the park rangers can watch for forest fires. I climbed up the tower, signed the guestbook, and spent about a half hour talking to the forest ranger about the forest and surrounding areas. Of course the view from the tower was spectacular. There were some maps of the area that showed some more detail than the map that I have so I took one with me. Af ter leaving the fire tower and getting down the paved road, I headed up another forest service road that indicated that there was a trail that was only open to motorcycles. I got to the trailhead and there were two guys hanging out on the tailgate of their pickup. I asked them if they knew anything about the motorcycle trail and one of the guys jokingly said that if I were to go down that trail, I’d have “the adventure of a lifetime”. He went on to explain that it was a narrow trail with steep dropoffs and nowhere to turn around. Even walking the trail was a bit challenging. I decided that I wasn’t really ready for an adventure and instead, hung out with them and chatted for a little while. According to these guys, about 10 years ago when they were out hiking in the woods nearby, they ran across some odd rocks that spelled out the names of the disciples from the bible arranged in the shape of a pentagram. Apparently, this was the site of some satanic rituals of something. I chatted with these guys for about half an hour and then headed back out on the road. By this time, it was about 2:00. I got back on to Breckenridge Rd and then on to Bodfish Caliente Road. This was another spectacular road with plenty of twisty roads through the canyons. I turned on to Walker Basin Rd and made a nice loop around and back on to Bodfish Caliente Rd. I went all the way to Bodfish and then turned back towards Bakersfield on Kern Canyon Rd. This was another incredibly twisty road that eventually came out on to Rt. 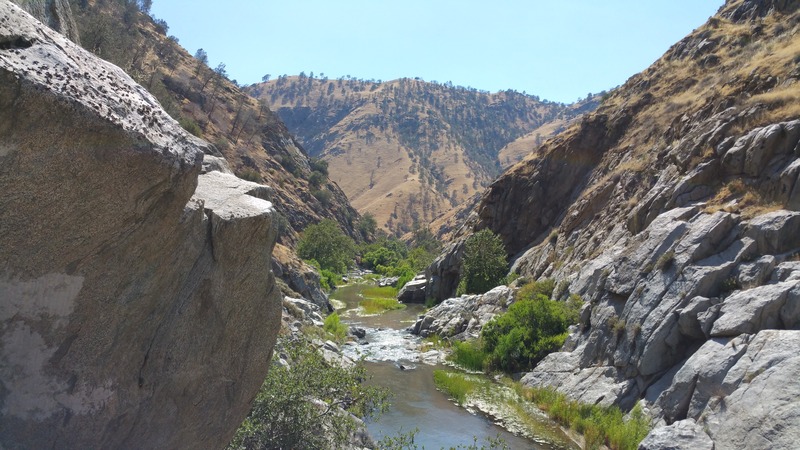 178 which runs alongside of the Kern River. I stopped a couple of times to take some photo because the scenery was so beautiful. 178 brought me back into Bakersfield where I found a room and stopped for the night. All-in-all, it was a great day of riding. I’m back out in California riding the Versys and visiting family for a couple of weeks. I’ve spent most of my time with my family and have only been out on a couple of short rides so far. I took a ride to the Dainese store in Costa Mesa and bought a pair of Dainese Delta Pro C2 Perforated Leather Pants. The pants are the final piece of gear needed for track day riding. After getting the pants in Costa Mesa, I took a ride on the Angeles Crest Highway and then over to Big Bear to break-in the pants and enjoy some nice riding. The weather was in the 70’s and great for riding. Tomorrow morning I’ll be heading out for a few days of riding. I’m planning to ride north towards Lake Tahoe zig-zagging back and forth across the mountains until it’s time to head back to Orange County to catch my flight back home.